Google AdWords already gives PPC advertisers a ton of data that we can use to optimize our accounts. Paid search advertisers always have the option to segment that data into very specific views to better analyze results and give us better data to optimize the accounts. Segments can be found on the second line of tabs in the AdWords interface. This blog will go through easy segments you can view in AdWords to capitalize on the low hanging fruits in your current accounts. Not every type of segmenting is available at every level. When you first set up a campaign in Google AdWords, you go through all of your desired campaign settings. The second step in assembling your campaign settings is confirming whether or not you want to be a part of Google’s Search Network Partners. If you have the Search Partners button checked, your ads are showing to an entirely different audience not on Google.com. Ask.com used to be a pretty big search engine. (R.I.P. Jeeves), but they currently do not have their own search engine anymore. Their search engine is powered by Google. That, my friends, is an example of a Google Search Partner, and there are thousands of other websites like these that can opt in to show your text or Google Shopping ads. 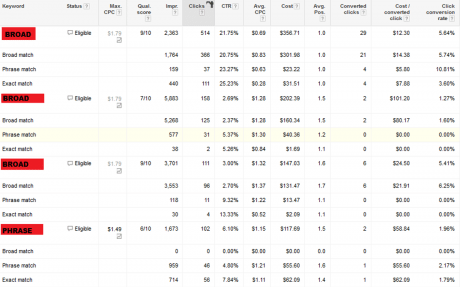 AdWords lets you segment your data to see how your Search Partner performance is doing compared to just Google.com. 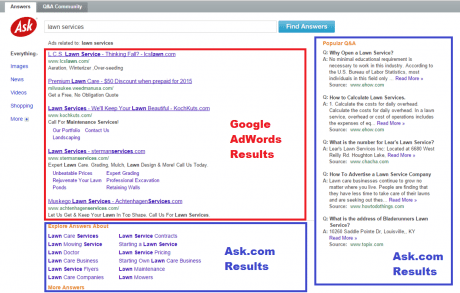 Here’s one example of segmenting by Search Partners to see how it’s performing. We can see in the example above that the Search Partner Network for both campaigns has a lower Click-Through-Rate, a higher Cost-per-Conversion and a lower Conversion Rate. After analyzing multiple date ranges, we saw the same trends. So it was an easy decision to turn off the Search Partners Network and utilize that extra budget to better performing components of the campaign. This is just one example. I’ve seen campaigns, with Search Partners enabled, do better than Google.com. It all comes down to analyzing what’s working for your account. An important thing to also consider with segmenting by Search Partners is your campaign goals. If you are conversion focused, then a lower CTR in the Search Partner Network might not be a big deal if your cost per conversions are much lower in that network. What’s also important to know is that Search Partner participation can only be done at the Campaign level. So if you see certain ad groups performing well with Search Partners and others are not, then you might want to consider creating new campaigns for certain ad groups. I’ve already talked about ways to improve your PPC performance on mobile devices. So how can you better track those changes? Segment your results in AdWords by mobile devices. In the image you can see that AdWords separates Mobile and Tablet devices when segmenting. Unfortunately Google doesn’t let us target these devices separately. We can only adjust our bid modifiers separately on Mobile and Tablet devices. Even worse, Bing has followed suit and also combined targeting of Mobile and Tablet Devices as one. If your mobile performance on the campaign level is not doing as well as the desktop performance, then you know you can lower your bids on mobile devices in AdWords. Another good way to use mobile segmentation is when you’re analyzing your ad performance. Mobile users are different than desktop users and may require a completely different voice in your ads. If you haven’t created mobile specific ads yet, you can see what messaging is working the best to help you create mobile-only ads. It is very common for PPC advertisers to break out their ad groups by keyword match types. I’ve seen success by doing that, but due to smaller budgets for most of my clients it’s not something I set up right away. AdWords allows you to segment your data by keyword match type to see which ones perform better. This can give an advertiser a better insight on if he or she should start breaking out ad groups by match type. In the example we see above, there are three modified broad match keywords and one phrase match keyword in the same ad group. The segment for each keyword shows us how that keyword performs when it relates to a user’s search query as a true broad match, phrase match, or exact match keyword. Looking at the first broad match keyword in the example, I can see that the phrase and exact match type versions of this keyword perform better from an ROI standpoint. The Click-Through-Rates are higher. The Cost-per-Clicks are lower. The Cost-per-Conversion metrics are better, and the Conversion Rate for phrase match is better. I’m also seeing that the quantity of leads are coming through the broad match version. This gives me good information to potentially breakout new ad groups based on the different match types to allow me to better adjust my bidding on my keywords. If you have all of your ad extensions created, there are several ways a user can click on your ad and go to your website. The click type segment in Google AdWords let’s users see which links on your ad are working or not. The example above gives me a good reason to start looking at my sitelink extensions. Click-through-Rates on this sitelink example are pretty low when sitelinks are normally the highest Click-through-Rate on my other campaigns. Ad extensions have a direct effect on your Quality Scores so using this report to find extension weaknesses will only help your overall campaign results. It’s very reasonable for a client to be in the number one position in organic and paid search traffic. Top positioning usually leads to more visibility and traffic. Even if your keywords are ranking number one, do you know if they are profitable? 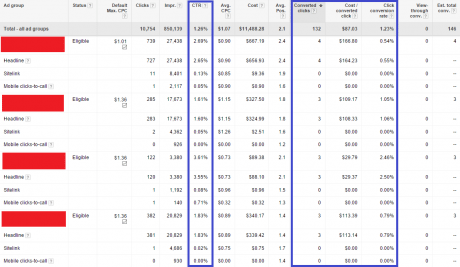 Here’s an ad group break out using the Top vs. Other segment in AdWords. Search Partners are shut off for this campaign so I’m looking at pure, Google results here. In both of these ad groups I see that Click-Through-Rates are much better being in the top position on Google, but look at Average Cost-per-Click, Cost-per-Conversion and Conversion Rate stats. All of those metrics are better when these ad groups are not in the number one position. Segmenting the data in this case gives me a reason to possibly lower my bids to not be in the top position if my main goal is ROI and profitability. There are other types of segmenting that Google AdWords offers. I only gave you a preview of some easy ones to start looking at. Explore everything AdWords has to offer and start seeing the positive results from analyzing the data in a different point of view. Last, use the 3 month, 6 month, and 1 year time frames when viewing this data to see if your results are truly a trend, or just a one time occurrence.